This symbol denotes events in the core programme, i.e. curated by the Festival. Click here to see all. 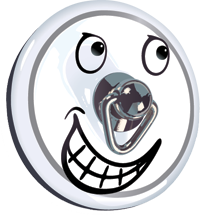 This symbol denotes Kids' Comedy Fest events. Click here to see all. This symbol denotes "Pay-as-you-feel" events (you can buy advance tickets to secure a seat or pay what you want on the day). Click here to see all. There is also an A-Z list of performers, plus a PDF of the brochure to view online. Printed brochures will be available from early March in many pubs, cafés and restaurants around Bath and surrounding areas, or from the Visitor Information Centre in Abbey Churchyard. Preview the brochure online. Wednesday 30th March, 2016 - Pre-Festival Fun! Thursday 31st March, 2016 - Pre-Festival Fun! Interactive Theatre International - The Wedding Reception Widcombe Social Club 12.30pm prompt £35 incl 2 course meal + cake! Tuesday 12th April, 2016 - Post-Festival Fun! Saturday 28th May, 2016 - Bath Comedy Festival @ Bath Fringe! Saturday 4th June, 2016 - Bath Comedy Festival @ Bath Fringe! Wednesday 8th June, 2016 - Bath Comedy Festival @ Bath Fringe! Thursday 9th June, 2016 - Bath Comedy Festival @ Bath Fringe! Wednesday 27th July, 2016 - July Previews! Thursday 28th July, 2016 - July Previews! Thursday 13th October, 2016 - Autumn Season! Friday 14th October, 2016 - Autumn Season! Tuesday 1st November, 2016 - Autumn Season! Tuesday 15th November, 2016 - Autumn Season! Thursday 17th November, 2016 - Autumn Season! Thursday 1st December, 2016 - Autumn Season! Friday 9th December, 2016 - Autumn Season! The Wedding Reception - A Dining Experience Widcombe Social Club 12.30pm / 1.00pm £37.50 incl 3 course meal! Pick up a copy of our glossy printed programme around town from early March, or if you would like a copy posted to you, please send an A5 sized s.a.e. with two first class stamps affixed, to Bath Comedy Festival, Programme Request, 4a Sussex Place, Bath BA2 4LA (programmes will be posted by return). You can also read the programme online - click here for details. Details of 2016 Bath Comedy Special events will be posted here when they come on sale.